Fans saddened by the decision of Franco’s big-name members to part ways have enough reason to smile after all. Besides, the acknowledged heart and soul of the group, Franco Reyes, decided to go on with the adventure, only that he’s gone doing it solo. That however does not mean he’s lost the momentum that glittered the original set-up of the band. In fact, he’s all the more fired-up considering he has something to prove now that his famous mates are no longer in the same stage playing with him. “Life goes on. Franco was never a superband. It was just a label that people gave us. We we’re just another band from different bands who wanted to jam,” downplays the singer-songwriter. And prove something he just did, with the release of the 17-track “Soul Adventurer,” which is being counted as the band’s sophomore album. Here, he recorded with a back-up band, no all-star line-up but which kept that artistic credibility that flavored Franco’s self-titled album. Giant label MCA Music is supporting Franco’s latest set of recordings for a number of reasons. Most important is the fact it believes in the music of the artist, regardless of who’s on board. 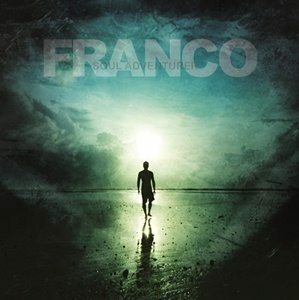 The new album contains tracks with meaningful titles relative to what happened like “What Is To Be Must Be”, “Renewal,” “A Beautiful Diversion,” and “Better Days.” For Franco the second track “To Survive” best represents the mood of the album. Sound-wise, reggae, rock, alternative and R&B turned out heavily reflected all over the album. Franco’s “Soul Adventurer” is now out digitally on iTunes- https://itunes.apple.com/ph/album/soul-adventurer/id595304390 and on CDs at leading record stores nationwide under MCA Music (Universal Music Philippines). 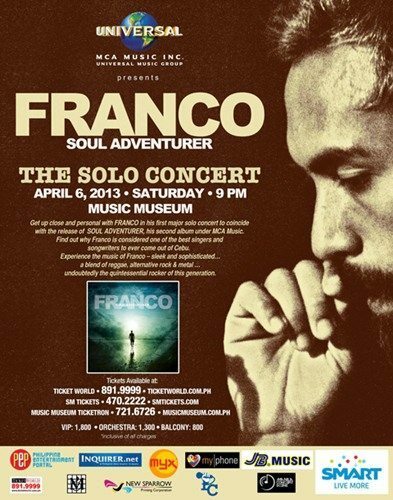 Get up close and personal with FRANCO in his first major solo concert to coincide with the release of SOUL ADVENTURER, his second album under MCA Music.